Sure, Seattle is a casual town. But job-interview day is no regular day. In Seattle, dressing for comfort is fine for the every day, but what about an interview day? When it comes to what the modern man should wear to a job interview, here are some do’s and don’ts. Look into what people in your prospective position/company wear day-to-day. Inside scoop: Lisa Quast spoke to people at Boeing, Redfin and Microsoft about appropriate interview attire in the local tech industry. Color conscious: Why you might want to avoid wearing orange to your next interview. What about women? Don't worry, we have more do's and don'ts for everyone. Navy or charcoal suits are solid picks, Taitingfong says. Do focus on color, style and fit. Color. A basic interview outfit might consist of a blue suit, blue shirt and a complementary tie, such as red and blue stripes, tonal stripes or a micro-patterned tie, says Bernardo Cozza, men’s sales manager at the Seattle location of Mario’s. A blue shirt is a solid bet, Cozza says. “Blue is a calm color,” he points out. Style. 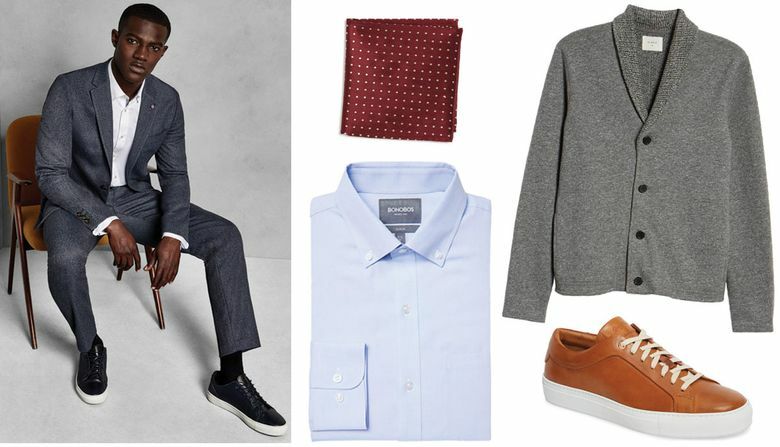 If the office is one in which shorts and sweatpants don’t raise eyebrows, your interview attire should still appear “put together,” Cozza says. You want to look like you care and pay attention to detail — critical for most careers. “No flip-flops,” Cozza says. Even if your interviewer is wearing a pair. Many men make the mistake of assuming a good suit can last a lifetime. “That’s wrong,” Cozza says, pointing out that lapels and notches widen and narrow over time. A suit bought in 1987 may look more like a costume than an appropriate wardrobe choice. “I don’t want to sound superficial, but it sticks in people’s minds. They might think, ‘This guy’s good, but his taste is questionable,’” Cozza says, who recommends a new suit every four to five years. Fit. “Make sure your clothing fits perfectly. If the fit isn’t right you won’t make the right impression,” Taitingfong says. Alterations may take up to 10 days, so try on your suit for fit well in advance. Cozza suggests three weeks, if possible. “For most people, a suit may be too loose. Maybe they’ve lost weight,” he says. Or maybe the opposite. Socks can match your tie, Cozza says, or be in the same color family (warm, cool or neutral) as the suit. Then pick out a pair of black, burgundy, cognac or light brown shoes, with buckles or laces. With professional-casual pants, clean loafers in good condition are a solid choice, Cozza says. “Footwear has become more casual over the last few years, and we see customers wearing an elevated sneaker with everything from jeans and a T-shirt to a suit,” Taitingfong says. Both agree: No matter which type of shoe you wear, cleanliness is of utmost importance. “If you wear a brand-new suit with a contrasting color of shoes that are scratched and dirty, it ruins the whole outfit,” Cozza says. You might even polish those oxfords, pre-meeting. But once again, a little goes a long, long way, he notes.